TCP, one of the largest manufacturers of compact fluorescent lamps in the world, now offers their high quality 19w SpringLamp in a convenient three-pack. These 19 watt CFLs are designed to replace conventional 75 watt incandescent light bulbs, with an average rated lamp life of 10,000 hours. 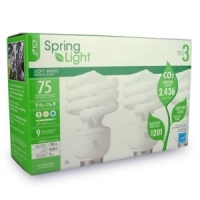 This product comes in three CFLs per package.